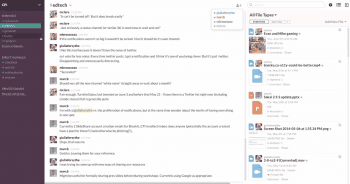 Slack is a communication tool that also doubles as a collaboration and project management tool. Keep this in mind next time you are about to dismiss it for an alternative. However, since 2013, it has grown to accommodate some tools that make the two possible. Even though it is a perfect tool, it comes close due to its ability to integrate apps to enhance its performance. If you are planning to use Slack for business, whether an established enterprise or an SME, you won’t be disappointed. It is great in collaboration and even better in communication. The real-time communication capabilities Slack offers is the best I’ve used in my professional career. Being able to upload files and integrate other software has been very beneficial for us too. The ability to “pin” a message or file to a conversation makes it easy for me to find important materials when I need to (if I can remember which user or channel the file is located). Also, the Google Hangouts link is a nice addition because you don’t have to leave the platform to call a team member. The platform logs me out a lot, just about every day which can be annoying. Also, when I inserted a Google Drive link in the past it would show the destination URL but with recent Slack updates, this sync has not always worked. Similarly, Google Doc or Spreadsheet links would show the name of the file once it was pasted into Slack so the recipient could see what the doc was before opening it. That functionality seems to have disappeared so now it just shows the long link without a document title. Finally, I wish message history would save for longer periods of time and not get deleted. The real-time communication capabilities Slack offers is the best I’ve used in my professional career. Being able to upload files and integrate other software has been very beneficial for us too. The ability to “pin” a message or file to a conversation makes it easy for me to find important materials when I need to (if I can remember which user or channel the file is located). Also, the Google Hangouts link is a nice addition because you don’t have to leave the platform to call a team member. The platform logs me out a lot, just about every day which can be annoying. Also, when I inserted a Google Drive link in the past it would show the destination URL but with recent Slack updates, this sync has not always worked. Similarly, Google Doc or Spreadsheet links would show the name of the file once it was pasted into Slack so the recipient could see what the doc was before opening it. That functionality seems to have disappeared so now it just shows the long link without a document title. Finally, I wish message history would save for longer periods of time and not get deleted. lack has become our ‘go to tool’ for internal communication, collaboration, and resource sharing at work. Whether conferencing or chatting with one employee or several, Slack enables us to quickly ask questions, share ideas, and post helpful resources with one another in a safe, secure environment. In Slack, all of our conversations and resources are archived and searchable, helping users reference important discussions that happened days, weeks, or even months ago. In addition, Slack features a very robust API, allowing integration with third party application like WordPress, Salesforce, and email marketing platforms. Slack has been incredibly industrious with their product roadmap, releasing new features at an aggressive pace. It would be very helpful if there were accompanying notifications, tutorials, and/or webinars that were available for users to help ease them into seeing the new changes. It can sometimes be a bit unnerving when changes occur that users are not aware of and this sometimes happens with Slack. Slack helps our organization communicate and collaborate more efficiently and effectively and helps us do so in ONE tool. Rather than having to use multiple tools for chat, video conferencing, text, etc. Slack enables us to do all of those things in a single tool that is both dependable and easy to use. lack has become our ‘go to tool’ for internal communication, collaboration, and resource sharing at work. Whether conferencing or chatting with one employee or several, Slack enables us to quickly ask questions, share ideas, and post helpful resources with one another in a safe, secure environment. In Slack, all of our conversations and resources are archived and searchable, helping users reference important discussions that happened days, weeks, or even months ago. In addition, Slack features a very robust API, allowing integration with third party application like WordPress, Salesforce, and email marketing platforms. Slack has been incredibly industrious with their product roadmap, releasing new features at an aggressive pace. It would be very helpful if there were accompanying notifications, tutorials, and/or webinars that were available for users to help ease them into seeing the new changes. It can sometimes be a bit unnerving when changes occur that users are not aware of and this sometimes happens with Slack. Slack helps our organization communicate and collaborate more efficiently and effectively and helps us do so in ONE tool. Rather than having to use multiple tools for chat, video conferencing, text, etc. Slack enables us to do all of those things in a single tool that is both dependable and easy to use. it is an awesome tool. I use this within my team and to other teams as well in my company. I found it very easy to create a group/channel whether it is public or private, we can add as many people as we want in the group. it supports a lot of emoticons, it can save the history for as long as you want. can send and receive large files using this. it is having the quite fast response to the chat with individual and with the group as well. we can make a video call, can share the desktop in easy clicks.in shorts I have found this very useful while performing my jobs and I feel quite relax and satisfied with the available functionalities with excellent tech. support. we can integrate with many apps and can even sen the mail to a user or a mailing list using this. I love the ability to be in touch with my colleagues through one single channel (instead of email, text messaging, phone calls, etc.). Additionally, the fact that there are multiple teams that you can connect to, allows this app to be usable for all the different projects, companies, family connections, or whatever you need. The ability to set notification and do-not-disturb times, to get notifications on various devices, and to have the app on desktop and mobile devices is huge! Oh, and I can create groups of people or channels to message easily. And the integrations with other programs make it a cinch to get notifications about sales, customer interactions, and more. Slack is the only IM service we need to communicate internally. It has replaced a lot of random text messages, emails that get buried, and phone calls that resulted in missed deadlines. Slack has improved our team communication significantly. I love the ability to be in touch with my colleagues through one single channel (instead of email, text messaging, phone calls, etc.). Additionally, the fact that there are multiple teams that you can connect to, allows this app to be usable for all the different projects, companies, family connections, or whatever you need. The ability to set notification and do-not-disturb times, to get notifications on various devices, and to have the app on desktop and mobile devices is huge! Oh, and I can create groups of people or channels to message easily. And the integrations with other programs make it a cinch to get notifications about sales, customer interactions, and more. Slack is the only IM service we need to communicate internally. It has replaced a lot of random text messages, emails that get buried, and phone calls that resulted in missed deadlines. Slack has improved our team communication significantly. Originally launched in August of 2013, Slack has quickly gained traction and became one of the most widely adopted workplace apps – both in and out of the office. At its core, Slack is just a messaging app for teams. Slack brings together all of your communications and files into one space. Slack helps organize your messages, conversations, online meetings, files and watercooler chat where everything is searchable and persistent on all devices. Slack is noticed for its unique design, sticky user experience, and simplicity – Slack is so much fun, you won’t even realize you’re getting work done, It’ll feel just like, well, slacking off. At this point, Slack has managed to gather about 4 million daily active users, with more than 1.25 million paid users. With unique beginnings, its no wonder Slack turned out to be such a unique solution. Slack started officially working on the app in the end of 2012, but began much earlier – the company was previously working on a web-based massively multiplayer game, but by their own account, failed to deliver. Slack was actually the team’s internal chat app, to help them share ideas and code without picking up the phone or leaving their office. The innovation has not stopped there and Slack quickly realized that team size plays an important role on how the app is used – eventually Slack expanded to even allow Enterprise and massive companies to establish their own solution on premise with the Slack Grid. Slack has easily grown to be one of the most popular workplace team collaboration and cloud based chat apps. If an office isn’t using Slack, chances are they have at least heard of it and considered the option. Slack can even be considered the catalyst for a trend shift we have seen in the past few years: the adoption of chat based collaboration apps to help get stuff done quickly, and easily. Similar applications have existed for years, reaching as far back as IRC, one of, if not, the original online instant messenger. But as time went on, technology ignored the instant messenger for the more organized and persistent email, which now thanks to Slack is slowly giving way to the chat app. These workplace chat solutions are more than just instant messengers, but allow for persistent information gathering and sharing just like email – but even simpler. The beauty of Slack specifically is the marriage of a unique, colorful and fun design, with only the few solid features you really need, and a wonderful user experience. While at its core, Slack is fairly simply – it’s a chat app first a foremost, with the ability to separate your conversations into distinct “rooms,” dedicated for different teams or topics, and individual one on one conversations. Slack also allows for file sharing, more recently voice and video calls, and even third-party integrations with other work apps, or custom user made bots to expand and customize if your team sees fit. But down to the basics, Slack allows your team to message and chat in the office or on the go, share files, and search it all within an instant. If you need to find that file the design team sent over last week, instead of hunting through a massive email chain or bugging the team again, Slack lets users simply search or scroll up in their chat log to find their previous messages. Overall, Slack is one of the best options for the small-to-midsize business that needs a simple, yet robust and capable, collaboration app. At its simplest chat form, Slack allows small teams to always stay in touch and keep information in one organized location. Quicker than an email, easier than a phone call, and less personal than a text message to your personal phone, Slack is the easiest and most fun workplace collaboration and chat app available. Large Enterprise teams can also utilized the more recent Slack Grid for their own on-premise and custom made solution. While Slack can be expanded and customized with integrations and add-ons, we recommend Slack for the more simple approach, where teams can get by with basic messaging and file sharing. What Do You Think of Slack?